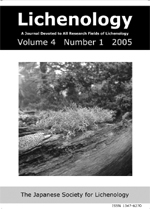 Harada H. & Yoshimura I.: Taxonomic Study on Calcicolous Lichens of Japan (1). Gyalecta kibiensis sp. nov.